In medium bowl, stir together green onion, brown sugar, ginger, garlic, soy sauce and sherry. Add pork, toss lightly to coat well. Cover and marinate in refrigerate at least one hour. 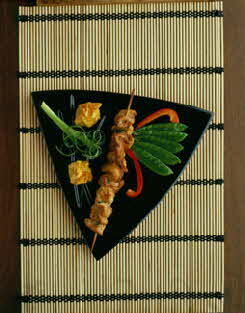 Prepare medium-hot fire in grill; remove pork from marinade, discarding marinade, and thread onto skewers. Grill directly over fire, turning to brown evenly, for 4-5 minutes. Common pantry ingredients combine to transform pork to an exotic Oriental favorite. Make these on the spur of the moment—they take little time to put together. Serve Oriental noodles or hot rice, and a sliced cucumber and carrot salad with rice vinegar dressing.